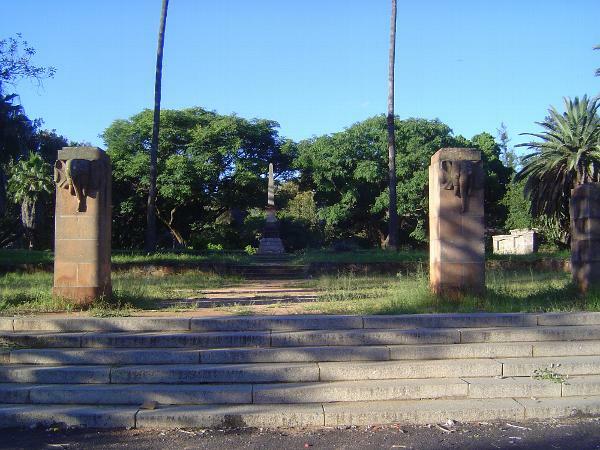 Blacks were kept out of Bulawayo for as long as possible, but settlements for them began to be built to the west of City Centre. Whites claimed the east side, where they at first lived in neatly gridded Suburbs. Later accretions got better names. "Suburbs" is separated from the city by Centenary Park. That would be the centenary of the birth of Rhodes in 1853. The Queen Mother came for the occasion. Park maintenance has lately suffered, but a pair of elephant survives, along with the obelisk in the distance.